Pete Placencia, Garfield Class of '59,visits City Hall & Roybal in the early '60s. It’s late Wednesday afternoon in Highland Park. Inside an art gallery sitting squarely in the center of the hipper, trendier-then-thou section of York Blvd. near new restaurants, bars stocked with craft beer, boutiques and design studios, a small group of middle-aged artists has gathered. Some have come with their wives. Among them are Leo Limón, Wayne Healy, David Botello, Robert “Tito” Delgado, J. Michael Walker, who greet each other politely and quietly explore the new venue, exuding the excitement and energy of kids at Christmas. They are familiar, highly regarded, almost stellar figures within LA’s now glimmering constellation of Chicano and Latino art. They are elder statesmen, if you will, accomplished visual artists who, at a pivotal moment in the last century, were themselves restless youth on the leading edge of an art movement launched amidst social and political unrest on the East Side of Los Angeles. 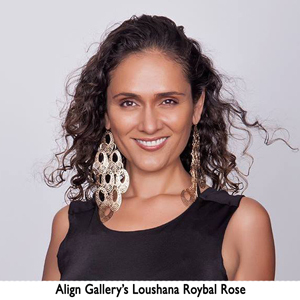 Align Gallery co-owner Loushana Roybal Rose is busy ushering people in, refilling appetizer trays, removing empty cups and making coffee. Bronze-skinned and radiant, she is unassuming in a simple but elegant grey cotton dress reminiscent of the lace-trimmed peasant dresses popular with free-thinking, counter-cultural women during the ‘60s and ‘70s. Gradually, she succeeds in getting most of her guests into chairs arranged in diagonal rows set back from the large storefront window that look south to the opposite side of York. Lillian Roybal Rose, Loushana’s 73-year-old mother, arranges herself on a small couch in the corner facing the audience. Lillian is clear, articulate and engaging as she begins to describe what is was like growing up as the daughter of another statesman, the late congressman Edward R. Roybal, at one point a towering—though by all accounts gentle and soft-spoken—figure in both Los Angeles and national politics. 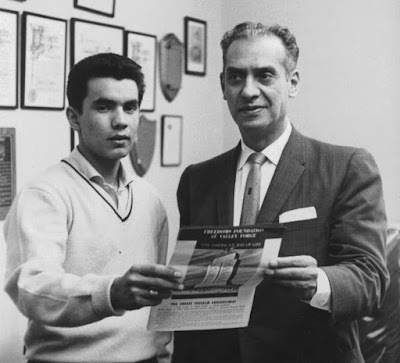 Elected to the LA City Council in 1949 as the first significant Mexican American leader to emerge from Boyle Heights, Roybal left City Hall after a 14-year tenure for an office in Washington, where he spent 30 years as a representative of the 25th U.S. Congressional District. Her mom’s powerful and impromptu recollections, Loushana says later, were a way to introduce and underscore the campaign to rescue her grandfather’s legacy of service and his implacable advocacy on behalf of minorities, working-class labor, the destitute, senior citizens and the physically challenged. Opened on October 10th, “Roybal: Man of the People” is the second of the three gallery events organized to coincide with the celebration of Latino Heritage Month. Curated by Loushana Roybal Rose and Jimmy Oballes, the exhibition features the work of Wayne Healy, Robert Delgado, Leo Limón, John M. Valadez, J. Michael Walker, Oscar Magallanes, Javi Herrera, Nery Gabriel Lemu, Michael Gomez Burton, David Botello, Joe Bravo and Align's Roybal Rose. Oballes, who was invited by Lester Grant to co-curate the 2014 “RISE: Love. Revolution. The Black Panther Party” exhibition installed at downtown’s Art Share LA, found Loushana and her fledgling art gallery almost accidentally during a Highland Park street festival held last February. She had opened her doors just two weeks before, she recounts. “So yeah, it was because of a bold gumbo, that we met,” says Oballes, who was one of many festival guests that didn’t care to brave the crowded restaurants or the long lines at the fusion food trucks. Align Gallery’s Rose Roybal had prepared a large pot of the traditional Louisiana fare to offer as a home-cooked alternative to the over-priced street festival food. At his suggestion, Rose Roybal postponed a previously scheduled exhibition in favor of a collaboration intended to restore regard for her grandfather in the collective consciousness of LA’s overwhelmingly Latino population. 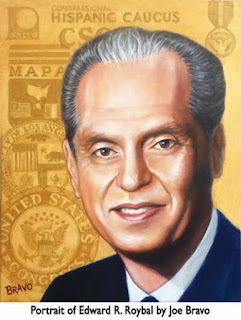 Both she and Oballes decry the fact that the contemporary Latino political class, the insider operatives, the padrinos who groom new candidates and even the current spate of officeholders have ignored, or are simply unaware, of Roybal’s important legacy. “That’s what happens when we we’re not involved with the way history is being taught at schools,” Oballes concludes. Leading political figures such as Richard Alatorre and Antonio Villaraigosa set a precedent, Oballes suggests, when they refused to offer anything more than lip service with respect to the East Side’s quintessential grass-roots community organizer, an incorruptible steward of the public trust. 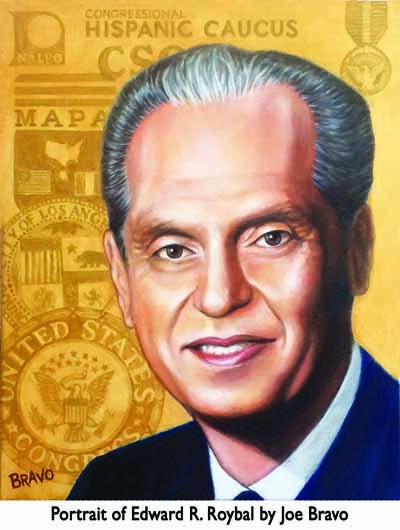 Many might argue that it was that assiduous commitment to ethical standards that propelled Roybal into office despite virulent opposition in an era when Mexican-American civic engagement was still unheard of. Roybal remained—through it all—an indefatigable man of the people, Oballes maintains. It astounds him that the first Latino from California to be seated in Congress nearly a century after the 1879 election of Romualdo Pacheco to the U.S. House of representatives is not more widely acknowledged among LA’s Latino civic leadership. According to Lillian, Ed Roybal proposed and defended bilingual education, supported affordable housing and held fast to the belief that government should provide access to education and opportunity as well as equal protection under the law for the less fortunate. Throughout his career he fought for the rights of Latinos, the elderly and the differently-abled, according to public sources. “He was the only Councilmember against bringing Dodger Stadium to Chavez Ravine,” she recalls. “And when the council voted to make people in the Communist Party or groups like that register with the police, he was the only one who voted no.” Walking out of City Hall on that day, she recalls painfully, she and her sister, current Congresswoman Lucille Roybal-Allard, were spit on by a mob waiting outside. Trained in art at San Francisco’s California College of the Arts, Loushana Roybal Rose was born in Santa Cruz and settled in the Bay Area where she worked with a number of high profile music industry concerns, among them the legendary Bill Graham Presents company. She sees the gallery as the perfect place to combine her roles as an activist working for social change, an artist and an event producer. “After college I put together shows and concerts with a lot of well-known acts,” says Loushana. After moving to LA ten years ago, she reconnected with her affinity for art, a calling which has found expression in her modest Mt. Washington home and the outdoor environments she has created there. Unsurprisingly, she has also opened up the spacious back yard behind the gallery, co-owned with her close friend and business partner, the Eritrean-born Selamawit Mekonen. While the both of them hold down the concessions, the outdoor patio is home to a monthly artisan market, a movie night and regular musical showcases. On October 24th, they host a special fundraiser benefiting the non-profit Lucille & Edward R. Roybal Foundation. The affair will be highlighted by a Día de Los Muertos altar honoring both of her grandparents and their devotion to public service. Beyond the Foundation, Roybal Rose harbors another dream. A single mother with little time to spare as it is, she is unequivocally serious when she shares the idea looming constantly in her head.